Your Mortgage Girl! "Mortgage Options . . . NOT . . . Restrictions! 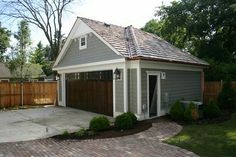 : "Do it your self garage" or "builder garage"? I had a wonderful conversation this morning with a client of mine that purchased a brand new home 3 months ago. She gave me some excellent feedback that I will share here and pass on to all my home builder contacts so we can help future home buyers. Megan had purchased a lane home with the option of getting a parking pad or a garage in the back. She was told to just build the garage on her own as it would be cheaper. Megan took this advice and decided to get into the home and then work on the garage aspect after possession. She has now learned that the builder garage package quoted at $16 000.00 was an excellent price. She has called a number of contractors and found out that she will need to pay a contractor $15 500.00 and THIS QUOTE WAS AFTER MANY THAT WERE HIGHER THAN THE BUILDERS QUOTED PRICE. With her time included, the Builder's Garage was the way to go. 2. IF YOU KNOW YOU WILL BE HIRING SOMEONE TO DO THE WORK, SAVE YOURSELF SOME HEADACHE AND TIME AND GET A QUOTE BEFORE YOU MAKE THE DECISION. She learned even the simple items for example,siding can be a headache. Did you know that upgraded siding bought in a big bundle could make no difference to the builders quote, but if you do it yourself, you are buying small amounts of siding, so your costs go up. buying community please feel free to share here or direct to me.